Doors Open Denver turned 11 this spring with the Denver Architectural Foundation hosting the showcase of Denver architecture and design from the recently renovated Union Station. The event ran April 25th and 26th and included open houses at some of Denver’s most notable historic buildings, as well as tours and open doors at many local firms. The event was headquartered at, and highlighted by, the newly renovated Union Station, a Beaux Arts masterpiece that has become the anchor of a vibrant and rapidly growing transportation district. Union Station’s renovated interior, by JG Johnson Architects, serves to enliven and activate the historic space, with the detailing and character of the many shops and restaurants forming a pleasing juxtaposition with the carefully restored and accented historical interior. 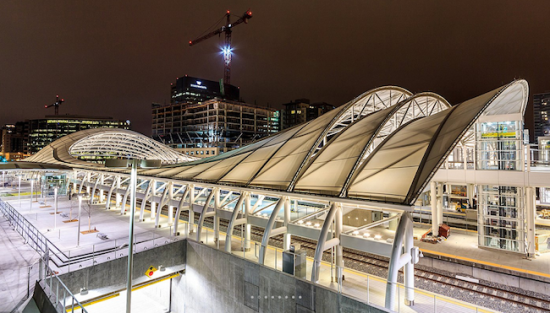 Behind historic Union Station sits a new commuter rail terminal, designed by the San Francisco office of SOM. 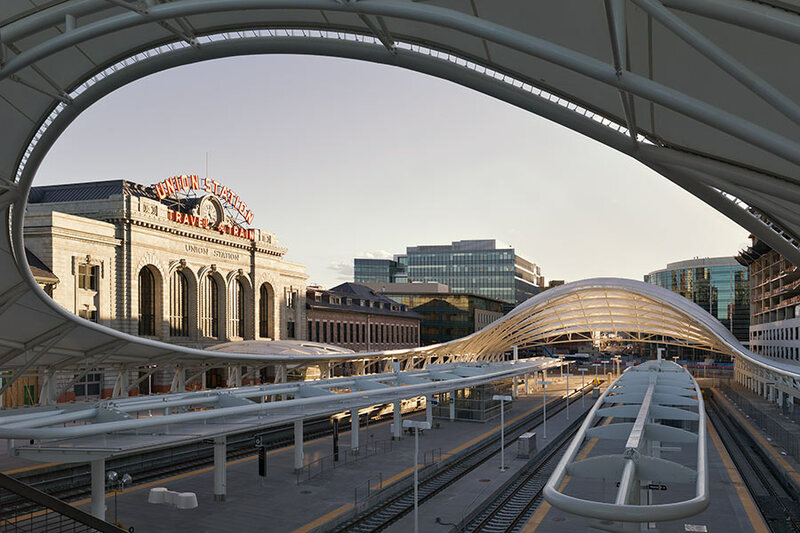 The soaring steel and fabric form is not to be missed and its nimble execution and tectonic expression does an expert job of subtly referencing Denver International Airport’s architecture, the destination of commuter trains departing the terminal. Other historical buildings that were open for visitors included the Oxford Hotel, the Historic Sugar Building with its two original Otis cage elevators, and Hotel Teatro in the Tramway Building. Distinguished contemporary buildings included the newly renovated Nichols Building, the deftly executed Clyfford Still Museum, and both Gio Ponti (North Building) and Daniel Libeskind’s (Hamilton Building) contributions to the Denver Art Museum. The theme of this year’s event was “Denver Classics: Then and Now” which Brit Prost, chair of Doors Open Denver and a partner at Davis Partnership Architects, described as, “ [a] showcase [of] how innovative new public spaces are transforming the urban landscape while complementing historically beloved buildings.” While Union Station and other select renovation projects have greatly improved the urban core, the small number of new public buildings cannot nullify the overwhelming onslaught of faceless residential mid-rise and high-rise towers assaulting the city’s aesthetic character. Jeff Sheppard’s (of SheppardRoth Architects) recent invective against this bland and developer-driven architecture should give pause to anyone celebrating the recent increase in Denver’s architectural cachet. One only hopes that as the citizenry experiences and learns about the exceptional public spaces being developed in Denver, the public will begin to demand the same level of design and civic and spatial engagement in residential architecture. Indeed, it is the role of events like this to educate the public and other designers and artist to the role good design plays in urban living.